I believe I’ve said it before, but, just in case I haven’t – historical films don’t have to be historically accurate to be good films. Ideally, yes, they would get every detail correct, but films are designed to entertain and to inform. Whether the events as shown in Captain Phillips accurately line up with the real-life event or not, it is pretty darn great film. 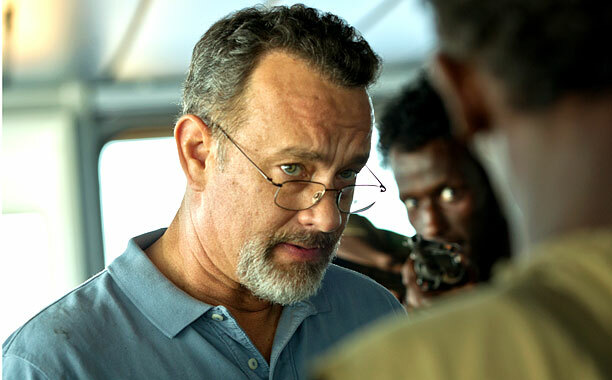 Tom Hanks plays Richard Phillips, captain of the Maersk Alabama container ship, who takes charge when his ship is attacked by Somalian pirates. Making smart tactical decisions that save the life of his crew and sacrificing his safety for the safety of the rest of the people onboard the ship, Phillips stands as a hero who takes a terrible situation and manages to walk away with not only his life, but the lives of the people he is responsible for as well. Hanks gives the best performance of his life…for, what, the fifth time now? Seriously, he continues to amaze me with his capabilities as an actor. I don’t know about the real-life Richard Phillips, but Hanks’ portrayal is filled with an incredible emotional depth. Through him, we see a compassion for not only his family and his crew, but also for the Somalian pirates who attack the ship. We also see his dedication to the job at hand, his solid resolve, and his desire to put others’ needs ahead of his own. The closing scene of the film, where Hanks’ character sits in shock with the nurse after being rescued from a hostage situation with the pirates, is one of the most emotionally powerful scenes I’ve ever seen. Barkhad Abdi plays the lead pirate Muse, and he’s pretty excellent as well. The pirates as a whole are equally dedicated to the task at hand. One of my favorite parts about the film is that it never portrays the pirates as bad guys; they are simply young men whose social situations demand that they find a more…creative…means of income. Phillips sees this side of the pirates, which is why he acts so compassionately to them. It also leads to a particularly sobering moment when he says something to the effect of, “surely you must be able to be something aside from fishermen or kidnappers,” to which Muse replies, “maybe in America.” This line highlights how good we have it over here in America, humanizing the pirates and showing that their intentions are not evil from their perspective – they are simply trying to live. My only slight criticism of this film is the shaky cam work that we have learned to be typical of Paul Greengrass films (cough Bourne Supremacy cough) makes an appearance here, and, though you could argue that it emulates the feeling of being on a boat in choppy water, it never really adds to the film. There really isn’t a whole lot to say about this film aside from praising Hanks’ performance. The only thing that might stop him from winning the Academy Award for Best Actor is Chiwetel Ejiofor’s performance as Solomon Northup in Steve McQueen’s 12 Years a Slave. The script here is smart, Hanks’ performance is top-notch, and the long run time never feels overbearing due to the suspenseful engagement of the film from the very beginning. Captain Phillips is one of the best biopics I’ve ever seen. Adaptations of books are often difficult to pull off, but 2012’s The Hunger Games (my review), based on Susanne Collins’ 2008 book of the same name, managed to be both a decent adaptation of the source material and a pretty good film, though it was certainly not without its shortcomings. When director Gary Ross was replaced by Francis Lawrence (I Am Legend), the question arose: will this new director be able to improve on Ross’ film, or will he make the same mistakes? I can happily answer that The Hunger Games: Catching Fire is an improvement over the original film in every possible way. The events in this film pick up shortly after where we left off at the end of its predecessor. Katniss Everdeen (Jennifer Lawrence) and Peeta Mellark (Josh Hutcherson) have returned to District 12 as the victors of the 74th Hunger Games. Since the Games, Peeta has learned that Katniss’ apparent feelings for him were merely an act in order to survive, and, as a result, interactions between the pair have grown cold. 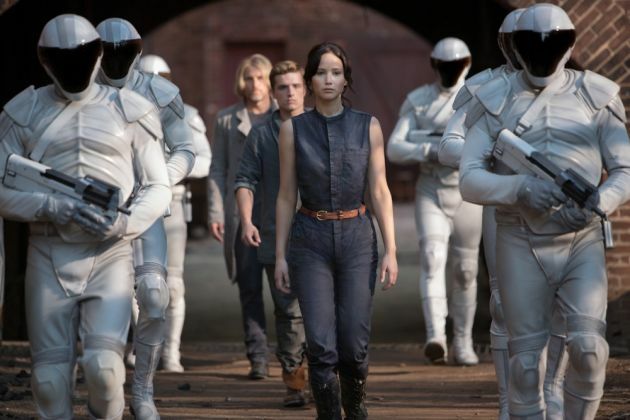 However, in a surprise visit from President Snow (Donald Sutherland) before the two leave on a tour of the districts, Katniss is told that her actions have incited rebellion in the other districts. She must convince everyone that her actions were of love for Peeta, not defiance against the Capitol, or the lives of her family, Peeta’s family, and her best friend/real love interest, Gale (Liam Hemsworth), will be at stake. When she fails to pacify the districts, Snow and the new Head Gamemaker, Plutarch Heavensbee (Phillip Seymour Hoffman), come up with a plan to not only get rid of Katniss, but to get rid of all of the other victors as well. Perhaps this film’s greatest strength is in its character development. Jennifer Lawrence and Josh Hutcherson as Katniss and Peeta, respectively, bring out the conflict of their characters’ relationship so well that it is sometimes even difficult for the audience to tell whether Katniss’ apparent affection for Peeta is genuine or merely an act. Katniss’ reactions to her sort of post-traumatic stress, to learning that she would be competing in the Hunger Games once again, and to Peeta’s near-death experience are all heartbreaking and incredibly intimate; it’s a true testament to Lawrence’s abilities as an actress. Her feelings for Gale seem more believable in this film because more time is spent displaying them. Liam Hemsworth does a fine job of displaying the hurt his character feels for having been betrayed by the girl he loves, and his defiance to leave and determination to fight the Peacekeepers to protect his district make the character more likable and make the question of “Peeta or Gale?” much more of a difficult question for both the audience and Katniss to answer. All of the familiar faces are also excellent, with my favorite performances coming from Woody Harrelson as Haymitch, Elizabeth Banks as Effie Trinket, and Donald Sutherland as President Snow. Haymitch has a great duality as both occasional antagonist and father figure to Katniss, and Effie is elevated above her role as comedic relief in the first film to a mother-like figure; when she bursts into tears to tell Katniss and Peeta how sorry she is that this is happening to them again, you just might shed a tear or two yourself. President Snow is, perhaps even more intimidating this time around as he threatens Katniss and the people she loves, or plots with Plutarch to kill Katniss in a new twisted iteration of the Hunger Games. Speaking of Plutarch, Phillip Seymour Hoffman plays him perfectly; his dry voice and cruel plans set the character up for a solid twist…one that I won’t reveal here. And, of course, all of the new faces are perfect fits for their roles. Sam Claflin as Finnick Odair, Jena Malone as Johanna Mason, Jeffrey Wright as Beetee, Amanda Plummer as Wiress, and Lynn Cohen as Mags all have their moments to shine and are all likable in their own ways. There are no weak performances in this film, which not every film can boast. The higher stakes of this film are introduced and dealt with extremely well. The themes of government control, independence vs. teamwork, and excess vs. deprivation are all explored and dealt with in their own ways. Katniss struggles with her desire to be independent, when in reality she needs to be interdependent on others – Peeta, Haymitch, Finnick, Joanna, Beetee – in order to survive. What we see in the Capitol versus what we see in the districts provide the contrast for excess vs. deprivation – colorful vs. colorless, joy vs. depression, stuffed vs. starved. It’s a powerful juxtaposition that really shows the extent of what President Snow and the Capitol will do to stay in control. The filmmakers don’t shy away from these deep themes, and they also don’t shy away from the same cliffhanger ending that the book leaves us with. There is much more to talk about here, but all would involve spoilers, so I’ll refrain for now. The point of the matter is that The Hunger Games: Catching Fire manages to take what was already a great film and improve on it to make a truly excellent film. In fact, I might even say that this is one of the only instances of me enjoying a film adaptation over its source material; while the book is great in its own respect, parts of it, like the excessively long beginning, worked better for me on the big screen. What Francis Lawrence has done here is, for lack of a better word, awesome, and it has me even more excited for the two-part adaptation of the third book in Collins’ The Hunger Games trilogy, Mockingjay. Directed by Andrew Stanton (of Pixar fame) and released by Disney, I became quite excited to see this film upon seeing the trailers, but I faltered when it was received poorly by critics and didn’t do well at the box office. 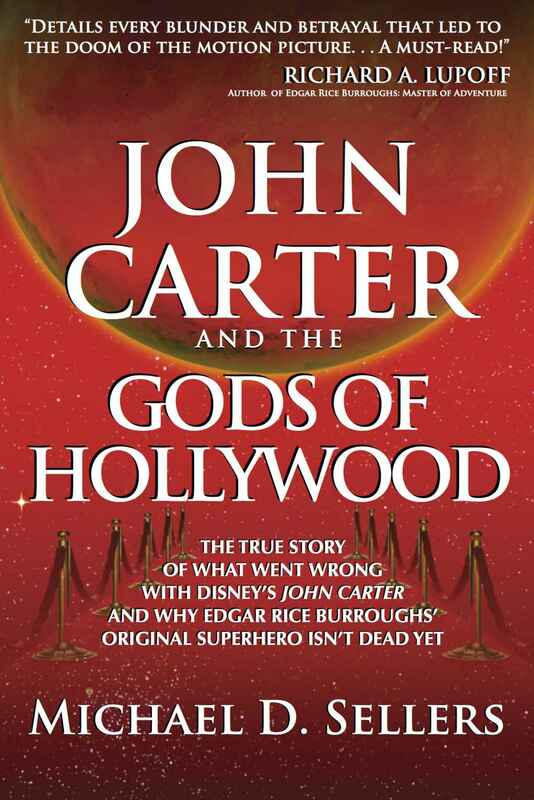 Recently, however, I read Michael D. Sellers’ book John Carter and the Gods of Hollywood (my review), which talks about why the film failed the way it did, getting me re-interested in John Carter and leading me to read author Edgar Rice Burroughs’ original book, A Princess of Mars (my review). All the while, I became more and more excited to see the film despite its negative reception – I wanted to see this world come to life! – and, now that I’ve seen it…what’s wrong with everyone? What is there to dislike about this film? For the first half hour or so of the film, I was pretty skeptical. A confusing, not-from-the-book opening scene raises many questions right off the bat, and the first few minutes of the actual film are not much better. I began writing out a mental list of complaints, but I shoved that aside the farther I got into the film. Does it have its problems? Well, yeah, but every movie does. Does it deserve all of the negativity that it has received? Not by any stretch of the imagination. Stanton takes plenty of liberties with Burroughs’ world and characters, but, looking back, I understand the reasoning behind every single one of them. While the John Carter of A Princess of Mars is a good guy just because he is a good guy and there’s no questioning it (it works great in the book), the John Carter of the film has issues; he’s stubborn, he’s selfish, and even disrespectful at times. However, all of this builds and builds to give Carter the opportunity to be the good guy, bringing a character arc that is needed for film. 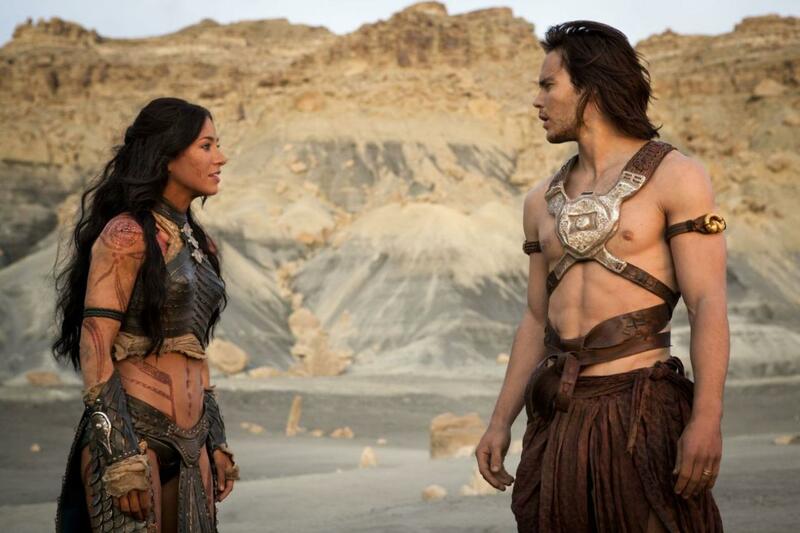 It is a pleasure to watch Taylor Kitsch as John Carter of Earth discover the part of him that is actually John Carter of Mars, willing to fight and die for the good beings of Barsoom. The Dejah Thoris of the book is not a warrior, nor is she a scientist, but she is both in the film, giving her a more active role in the story and letting her be more than just the romantic damsel in distress (which, again, worked really well in the book). Lynn Collins plays the character with an appropriate amount of spirit and energy, capturing both the romantic side of the character that would be required of a Princess of Mars, but she also brings the new feisty side of the character necessitated by the script. The addition of the mysterious Therns to the film is a bit confusing at first, and certain story elements and characters are removed, but all of it comes out okay, working for the film’s good. The scope of the film is just as large as that of the book, with the choice of filming in real locations rather than using a green screen being something that I think humanizes it a bit, making it more accessible to the viewers. Sure, the original story is meant to be “out there,” but it’s more the characters who inhabit the world and how they interact with each other that create the scope of the story, not the world itself. That being said, the visuals in the film are fantastic, from the look of the Tharks to the design of the airships to the wide expanses of desert mountains. Composer Michael Giacchino’s score to the film is appropriately reminiscent of John Williams’ original score to Star Wars without being a copy, and you can even hear a bit of his score to Star Trek (my review) every now and again, though I’m not holding that against him by any means. Giacchino keeps a perfect balance between bringing out the largeness and epicness of the adventure and capturing the intimate moments between characters, and his main theme is one of my favorites by him. There are certainly aspects from the book that I think would have worked well for the film, namely the story being told from Carter’s perspective or the more episodic style of storytelling, but the absence of these elements didn’t take away from my enjoyment of the film. In fact, the absence of these and other characters or story elements seen in the book helped to set the film apart as its own entity to be enjoyed. The important thing about this film is that it captures the heart of the source material without photocopying it from page to screen, and it does it in a way that is incredibly fun; the last half of the film, especially the few minutes just before the credits roll, are definitely my favorites. I should also mention that I liked Kitsch and Collins in the lead roles, but I also really liked Tars Tarkas as played by Willem Dafoe; he plays the character with a resolve that fits a character of his authority, but the compassionate side of the character also rings through, making him one of the best characters of the film. John Carter is not a perfect piece of cinema, but it’s good, old-fashioned storytelling at its best, with plenty of good humor, great action scenes, incredible special effects, and likable characters…and it’s certainly not deserving of all the negative criticism heaped upon it. If you haven’t seen it, give it a chance! I beg you! P.S. 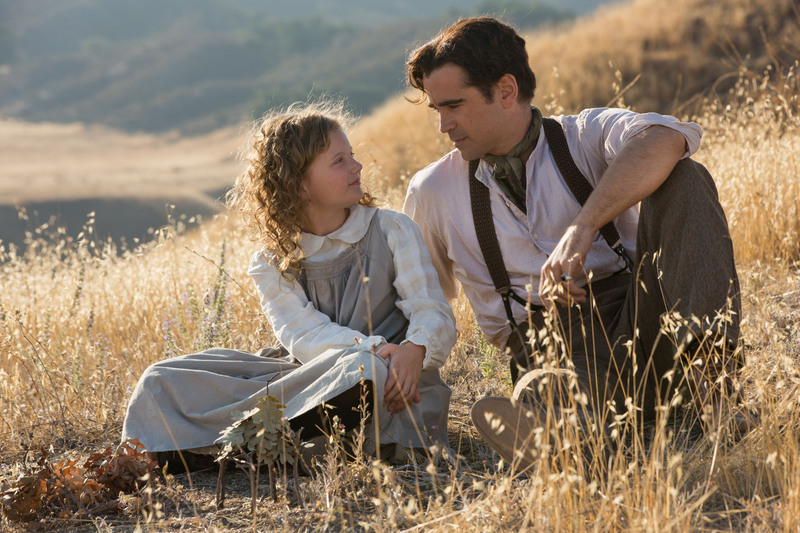 – Read my review of this film’s score, composed by Michael Giacchino, here! Over the past few years, I’ve developed a liking for the horror/scary/thriller movie genre, with Stanley Kubrick’s The Shining being a personal favorite. However, I’m not a fan of the blood-and-guts-style horror films that are so prevalent these days, so I’m pretty picky when it comes to which ones I’ll end up seeing in theaters. The Conjuring, directed by the director of Insidious (which I mostly liked), looked to be one of the horror films that was more of a on-the-edge-of-your-seat type of film than blood-and-guts, so I was quite looking forward to seeing it. 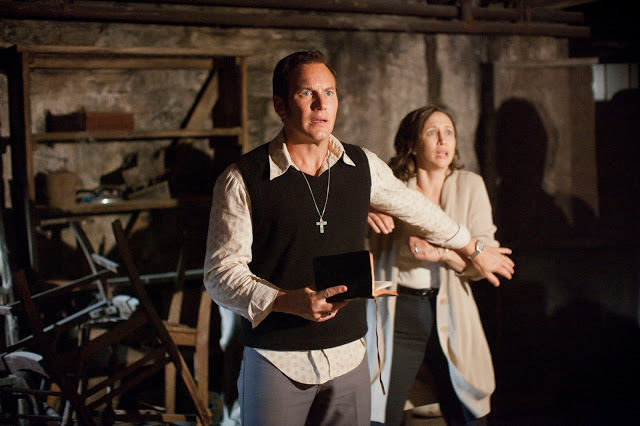 The Conjuring tells the supposedly true story of Ed and Lorraine Warren (Patrick Wilson and Vera Farmiga, respectively), two paranormal investigators, as they investigate the haunting of the Perron family’s house in Rhode Island in 1971. The family has witnessed clocks freezing at the same time every morning, picture frames being knocked off the walls, legs being yanked by an unseen entity while the children sleep, and even mysterious figures popping up in the cellar or elsewhere in the house. The Warrens discover that the house has a past associated with a witch who tried to sacrifice her baby before confessing her love to Satan and hanging herself. The race is on to find proof confirming the haunting and receive authorization from the Catholic Church to perform an exorcism. Every member of the cast does a great job, with the standout performances obviously coming from Patrick Wilson and Vera Farmiga as the Warrens. The two characters are Roman Catholics, a fact that is never shoved down the throats of the audience or presented as anything but two people who love and trust God. Their faith is never presented as silly or nonsensical, which is welcome after seeing many other films that tend to use Christian characters to poke fun at the religion. Another key performance comes from Lili Taylor as Carolyn Perron, the mother who is eventually possessed by the demon; the scene of her exorcism the most intense of the movie, with Taylor bringing plenty of weight and an incredible sense of anxiety to the screen. Though I have past acting experience, I can’t even imagine what kind of preparation goes into a role like this, but she pulls it off well and gives one heck of a performance. Shanley Caswell, Hayley McFarland, Joey King, Mackenzie Foy, and Kyla Deaver, the actresses who play the children of the Perron family, do a great job as child actors, bringing solid performances that are on par with the performances of their adult peers. I really enjoyed the camera work in the movie, with the use of a still camera in calm moments contrasting with the use of a handheld camera in the more intense scenes; the latter technique works really well in a film like this because it sometimes contributes to your eyes seeing things that may or may not be in the background of the film, increasing anxiety in a powerful way. The filmmakers also place cameras in unusual spots at strange angles, giving the sense that you are watching the scene from the perspective of the demon itself. The setting of the film, a farmhouse in the middle of nowhere, is typical of this genre, but it never seems cliché. Props like an antique music box and antique piano are introduced early on, with me scorning the filmmakers for falling into the traps of clichés, but I must admit that I was wrong. While these items definitely do play roles in the film, they are not used in a way that feels stereotypical. An unusual aspect of this film that is not typical of the genre is the Christian undertones. As mentioned, Ed and Lorraine Warren are devout Roman Catholics, so they approach their paranormal investigations from a biblical standpoint. Official approval from the Church is sought before performing exorcisms, the pair talks about how they were brought together “for a reason,” and the idea that it only takes a little bit of light to dispel a lot of darkness is presented strongly. The movie also stresses the importance of family in a huge way, most apparent in the climax of the film (which I won’t spoil here). My only complaint of the film is that I expected Lorraine Warren to get possessed at some point in the film; it is hinted at pretty heavily, at least, I thought it was, but it never pays off. I thought that her becoming possessed could have added extra suspense to the film considering her role as one of the people meant to rid the Perron family of the demon. However, after pondering this for a while, I thought that the decision to keep her possession-free might not be a wasted opportunity after all but rather a testament to the power of God. Lorraine Warren contrasts with Carolyn Perron because the former is a practicing Christian while the latter is not, explaining why she was possessed and Lorraine was not. That being said, I still think that the possibility of the demon possessing Lorraine was hinted at too strongly for it not to have paid off. Oh well. Anyway, as you should be able to tell by now, I quite enjoyed this movie, though it was certainly more intense than I expected it to be; I’m not ashamed to admit that I crept around my house with a flashlight upon returning from the theater the night I saw the film. It’s certainly not a film for the faint of heart…in fact, I’d venture to say that this just might be the scariest film I’ve ever seen, probably because its Christian undertones and biblical connections (Jesus drives out many demons during his ministry) hit a little close to home. However, being scared is the point of the movie, and The Conjuring does a wonderful job with that, bringing an emotional script, powerful performances, and a score by composer Joseph Bishara that could give you nightmares on its own. How does one judge a zombie film? I’ve personally never had any interest in the genre; in fact, I’m not sure if I’ve ever seen a zombie film or television show about zombies before now, excluding 2007’s I Am Legend (which I’m not counting because the “creatures” in the original book by Richard Matheson that the film was based on were actually vampires). 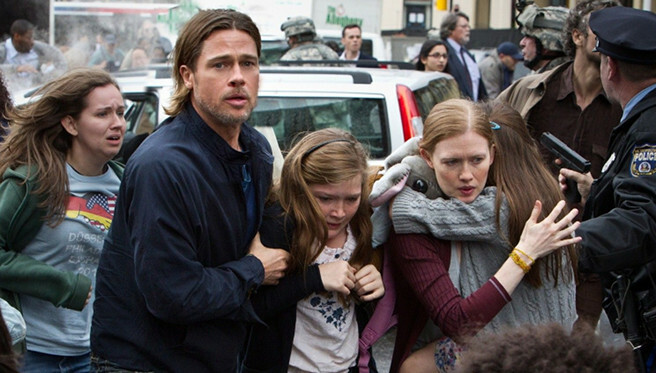 It’s a genre that I’ve always been skeptical of, so I wasn’t even sure if I wanted to see World War Z…frankly speaking, the trailers didn’t make me at all interested. However, I finally saw it, and, guess what? Wow. Based on the book by Max Brooks, World War Z focuses on Gerry Lane (Brad Pitt), who finds himself with his family when a pandemic strikes, throwing their home city and the entire rest of the world into disarray as the virus spreads. Gerry, who is a former United Nations investigator, uses his connections in the government to have his family evacuated to a safe haven on on US Navy vessel. Upon arrival, he is told that his talents are needed in order to find the origin of the virus so that a cure can be created, with the threat of his family being removed from the ship forcing him to comply. As he searches for answers, he must use both his brains and his brawn to survive the rapidly spreading pandemic in order to save the world. I mentioned I Am Legend earlier because I was getting lots of I Am Legend-y vibes while watching the film: both stories essentially tell the story of a man fighting a world-destroying virus in search of a cure. This may seem pretty generic, but, as my best friend pointed out to me, there is even a moment in WWZ when Gerry wakes up hanging upside-down with blood dripping from his head and a piece of metal stuck in his body…sound familiar? The zombies as presented in this film are remarkably similar in behavior to the creatures of the I Am Legend film adaptation, though, as I mentioned above, the creatures in the original book are actually intelligent vampires that are capable of speech. It’s easy to see the similarities between these two stories, but, honestly, I didn’t feel like this film was a direct rehash of the Richard Matheson classic. One aspect of the film that I find particularly surprising is how much it makes me care for the characters. This genre of film is not one usually associated with high-quality drama, but its commitment to taking itself seriously and focusing on more than just action makes it more than just a summer zombie action flick. Gerry’s relationship and split with his family feels both genuine and, as a result, painful, as we’re forced to see them separate in such a volatile situation. Brad Pitt brings quite a bit to the role, with Gerry’s obvious dedication and commitment to the task at hand and to the people around him, even those he doesn’t know, bringing a depth to the character that didn’t need to be explained to be conveyed. The film’s attention to detail is also admirable. At one point while we were on the US Navy ship, I saw people storing what appeared to be large framed paintings, which I took to mean that they were trying to preserve whatever culture and art that they could in the wake of this disaster. There are many subtleties along the same lines that appear throughout the film, which I appreciate quite a bit. The score by composer Marco Beltrami, which I admittedly haven’t purchased or listened through, worked well in the film, but the most compelling parts of the score in the context of the film are the moments in which there is complete silence aside from the on-site action; for example, there is one scene toward the beginning of the film in which Gerry and his family are running away from approaching zombies where all we hear is the sounds of the family running and of the chaos surrounding them. It’s a powerful device that isn’t always used well, but silence as a tool is put to good use several times here. I asked at the start of this review how you can judge a zombie film – a genre that is meant to be full of blood, gore, and mindless action. Thankfully, I don’t have to answer that question just yet because, although this film has zombies in it, it is so much more than a “zombie film.” World War Z manages to surprise in a good way; it’s full of heart, suspense, and, heck, there’s some good action too, and it balances these aspects in a way that makes it better than your average summer blockbuster.